Diplomatischer Besuch bei Brose: Der US-Generalkonsul in Bayern, William E. Moeller (3.v.l. ), traf sich zu einem Meinungsaustausch mit dem Vorsitzenden der Brose Geschäftsführung, Jürgen Otto (2.v.l.). Über ihre Tätigkeit in dem Familienunternehmen berichteten die beiden US-amerikanischen Brose Mitarbeiter Todd Carlson (links) und Lorrie Dryer. Brose is supporting the introduction of a dual-track vocational training system in the State of Michigan. Jürgen Otto, CEO of the Brose Group, presented a dual-track training project to the US Consul General in Munich, William E. Moeller, last week when he visited the family-owned company’s Coburg site. “North America is a very attractive market for us and offers long-term growth,” Jürgen Otto explained during their talks. This means that Brose’s four US locations in Detroit, Tuscaloosa, Jefferson and New Boston, which together employ around 1500 people, are very important for the company’s future development. “Implementing the same quality standards worldwide is key to our company's success,” said Jürgen Otto. “This applies to our products and to employee training. So we decided to export the successful dual-track vocational training model to the US." William E. Moeller was also particularly impressed with the apprentices’ workshop and the concept of the Brose Junior Company during his tour of the Brose site. As the diplomat explained, the US President also aims to introduce a dual education system. In his State of the Nation address in February, Barack Obama described German vocational training as a model for the United States. Training activities at Brose go far beyond the training of young people. High importance is also placed on know-how transfer and sharing personal experience. This is why a large number of foreign employees work at the company’s central locations in Coburg, Bamberg-Hallstadt and Würzburg. 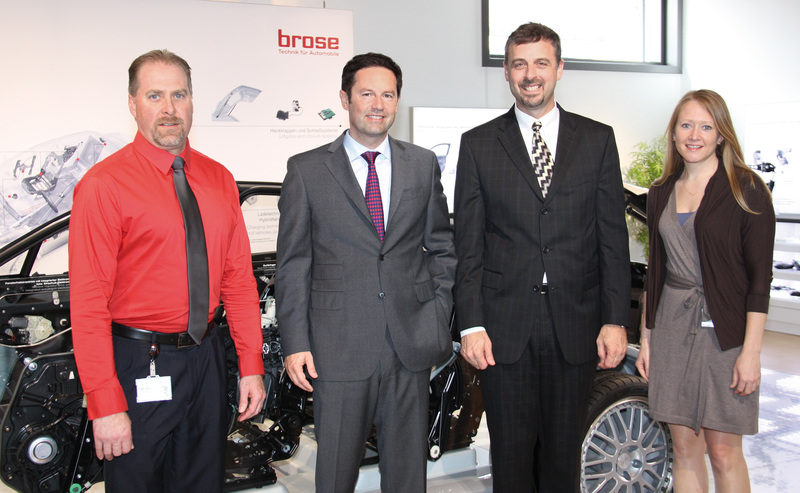 Americans Lorrie Dryer and Todd Carlson told the US diplomat about their experiences at Brose’s Coburg location.